The Bible reveals the fact that the name “God” can properly apply only to Jehovah God and his Son, our Lord Jesus Christ. Jehovah is entitled to be reverenced because he is the Almighty God. Jesus Christ is entitled to be reverenced and worshiped because, while not the almighty God, he is a mighty one and both Jehovah and Jesus use their power lovingly, justly and wisely. …[Jehovah] is declared to be the Father of the God called Jesus Christ. 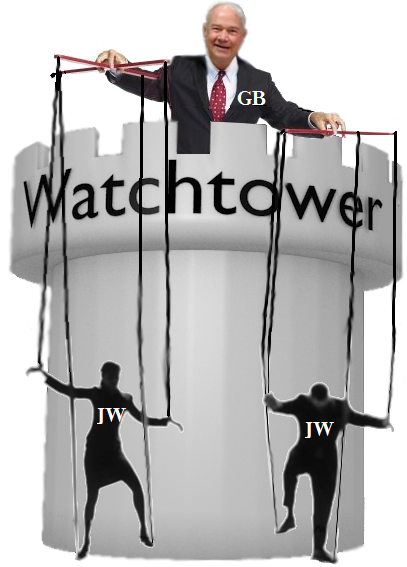 Given the above, and the fact that Witnesses regularly refer to Jehovah as “Jehovah God,” it is only fitting that they worship Jesus and refer to him as “Jesus God” with full Watchtower blessings. Yes, reverent adoration should be expressed only to God. To render worship to anyone or anything else would be a form of idolatry, which is condemned in both the Hebrew and the Greek Scriptures. Issue resolved? Well, no. I’m sorry to be a stickler for the facts, but there’s still an issue. When did Jesus appoint the faithful slave over his domestics? To answer that, we need to go back to 1914—the beginning of the harvest season. As we learned earlier, at that time many groups claimed to be Christian. From which group would Jesus select and appoint the faithful slave? That question was answered after he and his Father came and inspected the temple, or spiritual arrangement for worship, from 1914 to the early part of 1919. * (Mal. 3:1) They were pleased with a small band of loyal Bible Students who showed that their heart was with Jehovah and his Word. But do you see the problem here? In 1919, and up through at least 1929, the “spiritual arrangement for worship” included worshiping Jesus: the wrong “God” — in fact, not a God (capital G) at all according to the brighter light! Someone who is not a God, but is worshiped as a God is a “false God.” The “Bible Students” were–according to current Watchtower understanding–idolaters! And we all know how pissed off Jehovah gets at those damned idolaters. That would seem a fatal flaw. Why would Jesus judge this group as God’s “true worshipers” when they were worshiping a different, false God? This question is all the more pertinent when you realize that there were other denominations that were only worshiping the God of the Bible. The Christadelphians, for instance, were not worshiping Jesus in 1919. Oh, but you say: the Bible Students were the ones “making God’s name known.” Sorry; they really weren’t. The name did not become prominent in the group until 1935 when they changed their own name to Jehovah’s Witnesses. In the 1919 Watchtowers, for instance, the name of Jesus appears 3 1/2 times more than the name Jehovah. Besides, as the Watchtower itself has admitted: Jehovah is not God’s name. If we look at what the Witnesses claim is the “truth” today, then the Christadelphians where closer to that truth in 1919 than the Bible Students were. If Jesus had made any judgment in that year, the winners would not have been the Bible Students; the blue ribbon would much more likely have gone to the Christadelphians. JWs also used to celebrate Christmas, called Jesus Alpha and Omega, etc. They are wrong on so many things and the evidence sinks their ship. It is evident that they are the blind leading the blind, a manmade fallible organization of smoke and mirrors. If Satan cannot get you to be a Hell’s Angel, then false religion will ensnare and lead to the same destiny. The biblical, historical, orthodox view is that Jesus is in fact Almighty God, YHWH in the flesh. Those who deny this are pseudo-Christian cultists. You may be right, William. But I find it interesting that these two restorationist sects have both arrived at the belief that 1st century Christians did not believe that Jesus was God. According to Wikipedia’s article on Early Christianity: ” Early Christian views tended to see Jesus as a unique agent of God,” and the idea of Christ’s divinity did not fully evolve until the Council of NIcaea in 325 CE. I wasn’t around in the first century, so I don’t claim to know. Because there is so much disagreement within the Bible itself, no one can honestly say that there is a clear message on much of anything. That’s why there are so many Christian sects; no one can agree on what it all means. I think the various writers had differing ideas. The Trinity concept was one clever way to try and bring harmony to some of their discordant views. However even such mental gymnastics fail to cover everything. We’re left with sects of Christianity choosing a side and then explaining away the verses that don’t fit their interpretation. The Witnesses do it from the anti-Trinitarian perspective, and the mainstream Christian denominations do it from a Trinitiarian perspective. There is no clear winner. Personally, as an atheist, I have no desire to enter into such squabbles between religious sects. I find it incredible that people presume that they know anything at all about the nature of invisible spirit beings. And I don’t care if someone wants to think that their god is one, two, three or more persons — as long as they don’t go back to killing each other over it. Correct. No use debating who God is, what He is like, etc. if one denies the existence of God. Thanks for the feedback, Erica; it’s always good to hear. And thanks for sharing your experience. Many of us here can relate; breaking free of a cult is an intense emotional experience that is tougher to survive than anyone who hasn’t been through it can imagine. Kudos to you for making that journey. I’m glad we were here to give you a smile along the way. Previous Previous post: Jehovah’s Witnesses Kill Me! Next Next post: Will Jehovah “Make it Right”?